Enter to win more great prizes. If you comment on ANY blog stop post with your email address, you're guaranteed to receive a free ebook. Since you left your email addy you're now entered into today's draws. Good luck. This is stop #27 for me!! This is fun!!! I wanted to buy the book, but I was hoping for a paperback copy. Can I get one?? 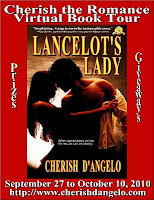 Hi Sarah, Lancelot's Lady released as an ebook only. There's no word on a paperback edition at this time. With an ebook, you can read it on your PC, laptop, and select ereaders and smartphones. great post on virtual blog tours at gumbo! ty for sharing. You're very welcome, Pam. Thank YOU for stopping by.